These Spinach Feta Meatballs are perfect for a quick, healthy dinner. 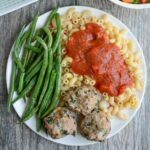 They’re freezer friendly and a fun change from plain meatballs. Mix well and form into 12-14 balls. Bake at 400 degrees F, flipping once, for 18 minutes. To freeze, mix and form into balls. Freeze on a plate or baking sheet, then transfer to a Ziploc bag and store in the freezer. When ready to bake, thaw in the fridge overnight and bake as directed or bake straight from frozen…you may just need to add a few extra minutes cooking time to ensure they reach an internal temperature of 165 degrees F.
You could also bake all of them, freeze cooked and simply reheat when needed. If you’d prefer to use fresh spinach, simply saute until cooked, chop and mix into the meatballs.